Does Water or Ginger Ale Make Plants Grow More? 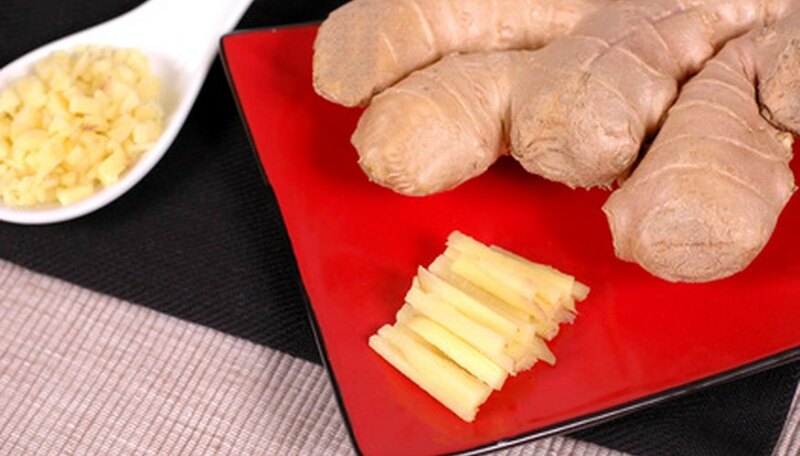 Can the Tubers of White Butterfly Ginger Be Eaten? Many uses exist for ginger root in the kitchen. Not only can you make a delicious hot or cold tea with grated ginger root, but also, many cooks enjoy adding ginger root to both baked items and savory dishes. When you plant a ginger root in your garden, it will grow easily into a large plant with attractive foliage. Wait at least five months before you harvest ginger root. Harvest small pieces of the outermost ginger root as early as 4 months after planting your ginger. Use your hands to remove the roots growing on the outside edges of the ginger clump carefully. Try not to disturb the other portions of the ginger root clump as you remove these small portions of root. Remove the entire ginger plant after 8-10 months of growth. Watch the ginger plant for signs the roots are ready for harvest. When you notice the leaves begin to wilt and die, harvest the ginger. Use your hands to break up the root clumps. As you break up the clumps, choose several roots with eyes (growth buds) because these roots are ideal for replanting. Replant these roots immediately if you desire by placing them beneath approximately 4 inches of soil with the eyes facing up. Take the remaining ginger roots into the kitchen. Peel the outer skins of the ginger roots. Chop or grate the ginger for use in your favorite recipes. Use sharp scissors or pruning shears to cut away any brown, diseased or damaged foliage during the year. If the leaf appears mostly healthy, only trim damaged portions. Dip the scissors or pruning shears in rubbing alcohol between cuts to inhibit the spread of disease. Cut the ginger plant completely to the ground when it goes dormant in the fall, when you will notice the stems and foliage drying up and turning brown. The brown foliage will not regenerate. Cut away any frost-damaged foliage as it will not regenerate and needs to be removed to prevent disease spreading to living areas of the plant. Work a garden fork under the ginger plants to loosen the rhizomes. Lift the plants and separate the individual plants. Remove grass, weeds and debris from the planting area located in partial or full shade. Loosen the soil to the depth of 8 inches with a shovel. Break the soil up with a garden hoe. Rake the soil level and smooth. Spread 1 inch of sand over the soil and 2 inches of well-rotted manure. Work these amendments into the soil to the depth of 8 inches. Dig a hole as deep and wide as the ginger roots with a hand trowel. Set the plant into the soil and firm the soil around the ginger plant. Plant the other ginger plants 15 inches apart. Sprinkle the area with water until the soil is wet. Buy ginger root from the grocery store. Look for smooth, well shaped roots with a lot of knobs on the surface. The knobs are where the growth will occur. Fill an 8 inch pot with rich potting soil. 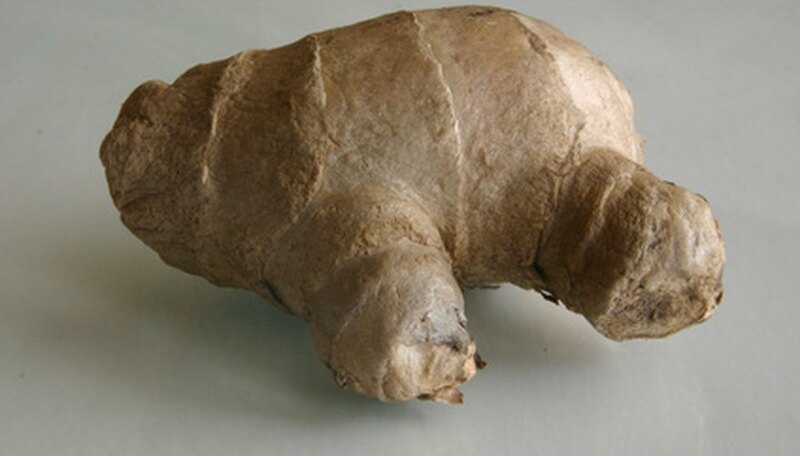 Lay the ginger root on its flat side directly on the surface of the soil and water well. Place the entire pot into a plastic bag and then place the bag in a warm place. Check daily. When buds start to grow, it is time to transplant your ginger into the garden. Find an area of your garden that is shaded for most of the day; a few hours of morning sun is ideal. 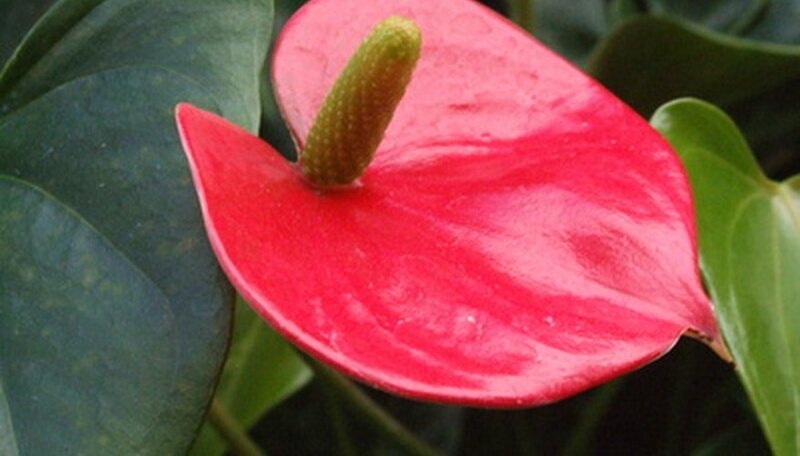 Dig a shallow hole, place the ginger root in the hole and cover with about ½ inch of soil. Water well. Ginger root takes about 9 to 10 months to reach harvestable size, although you can dig around the plant and cut off a piece of the root to use at any time. Leave the rest of the root underground and the plant will continue to grow. After about 9 or 10 months, dig up the plant. Remove the quantity of roots you desire, and replant the remaining roots. Because ginger is a perennial, it will continue to grow and thrive in your garden indefinitely. For a continuous supply of ginger, dig up and harvest regularly. Water makes plants grow more than ginger ale. 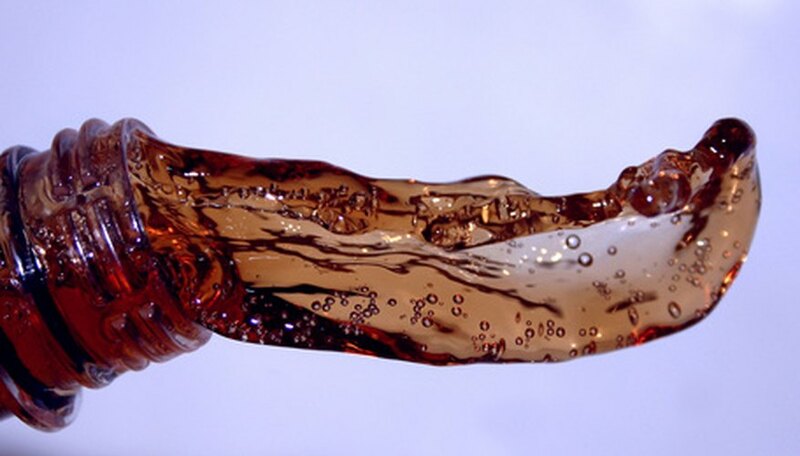 While plants require the water that ginger ale contains, the beverage also includes sugars and other minerals or ingredients that prevent the plant from absorbing water from the soil. Chose a ginger root that has small fresh green buds on it. Fresh ginger can be purchased at most grocery stores. Fill a planting pot with compost. If you do not have access to a compost pile you can buy it is small bags from most garden stores. Bury half the ginger root in the compost and pat down the soil around it. Water the newly planted ginger root thoroughly and keep the soil damp throughout the spring and summer months. Place the ginger root in a warm sunny spot inside such as a windowsill, covered porch or warm greenhouse. In the fall the ginger plant will die back. Discontinue watering and let the soil dry out over the winter. In the spring resume watering and the plant will begin to produce shoots again. Plant ginger in partial to full shade. Choose a location where soil has a high organic content and good drainage. The preferred pH for ginger is between 5.5 and 6.5. If needed, amend the soil before planting to achieve a pH in this range. Make sure the rhizome is fully covered with soil when you plant it. Hill around the plant periodically to keep it covered. Water a ginger plant frequently during active growth, in spring and summer, in the absence of rain. In the fall, as the leaves die down, discontinue watering, then begin watering again in the spring to encourage leaf emergence. Fertilize a ginger plant once a month during active growth. Use a standard mix such as 15-15-15, applying according to label directions. Harvest the roots of culinary ginger in the fall after the leaves have died back. Dry roots in the shade before storing. Plant ginger lily where it will be exposed to at least six hours of sunlight every day. It will do best planted in morning sunlight and afternoon shade. Alternatively, plant ginger lily in dappled or broken sunlight. Feed ginger lily once a week with a balanced fertilizer with a ratio such as 10-10-10 or 12-12-12. Follow the fertilizer's label instructions for application specifics. Keep a 1-inch layer of mulch such as pine needles or bark chips around the white ginger to keep the soil moist and protect the roots during the winter. Water the plant weekly during warm to keep the soil moist during dry weather. Water more sparingly during the winter. Remove flowers as they wilt and fade so the ginger lily will continue to bloom as long as possible. Remove dead or wilted foliage to keep the plant looking neat. Divide ginger lily in spring or late winter when the plant begins to look old or unproductive or if the plant begins to outgrow its alloted space. Lift the entire clump of ginger lilies from the ground with a garden fork or spade. Divide the clump into smaller segments by hand or with a sharp knife. Discard old, woody sections, and replant the smaller sections. Ginger root is not acidic. It is a medium-alkaline food that is often used to aid in digestive problems, as it helps lower acidity in the stomach. Dig up the ginger rhizome by carefully cutting into the soil in a circle around it. Divide the rhizome into pieces that contain at least one stem, and up to four. Inspect the roots on each piece of rhizome. If they are small and not completely developed, cut the stem in half and dispose of the cut portion. Dust the pieces of rhizome with fungicide. Pour vermiculite into a pot, to within 1/4 inch of the rim, and water it until it is completely wet. Allow the pot to drain. Create a 2-inch deep hole in the vermiculite and place the rhizome into it. Cover it with soil and place the pot in a well-lit area, out of direct sunlight, that remains above 50 degrees F.
Water the vermiculite to keep it moist, not saturated. You will know that the ginger rhizome has rooted when it produces new growth. Plant ginger in the spring in an area with partial sun or shade and fertile, moist soil. In full sun the leaves turn brown and the plant grows poorly. Ginger can grow in almost any soil--with some amendments--as long as it is well-drained. Mix organic compost into the soil before planting. Plant the rhizomes 1 inch deep in the soil, spaced 15 inches apart from one another. Water the ginger plants throughout the growing season, keeping them moist but not soaked. Overly saturated soil promotes root rot and stunted growth. Stop watering just before the tops die down in the fall. Fertilize the ginger monthly during the growing season. Use a complete, balanced fertilizer and follow the directions on the package for application instructions. Dig up some or all of the rhizomes in the fall once the tops die down. Divide and replant these rhizomes in the spring or use them for culinary purposes. Prepare your garden soil with a mixture of peat moss, kitchen compost and loam soil. Alternatively, you can add these ingredients to a large-sized planter box. Loam soil is comprised of sand, silt and clay, giving it a higher amount of humus than other soils. The nutrients produced by the loam soil, in addition to the peat and compost, allow tropical ginger plants to thrive to their fullest potential. 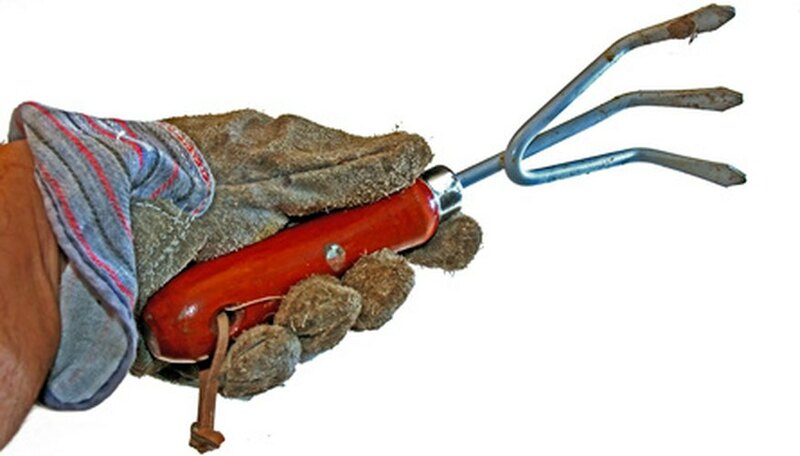 Mix the soil and enriching ingredients thoroughly with a hand trowel or garden hoe. Evenly disperse the ingredients, chopping at solid chunks if needed. Dig down into the center of the enriched soil, creating a sort of burrow, measuring approximately 8 inches deep. Dump the live earthworms into the hole and cover them up with the soil. Pat down the top of the soil to level it. Insert the tropical ginger root approximately 3 inches beneath the surface of the soil. Water the area liberally once every four days, administering approximately two gallons of water at a time. Once the tropical ginger plant reaches a foot in height, increase the amount of water to three gallons every four days. Prepare a partly sunny growing area for planting the ginger plants. Cultivate the soil down to a depth of 4 inches. Add 2 inches of compost to the top of the soil and work the compost into the soil with a garden spade. Plant each piece of ginger root in the soil with the nodes facing up. Space the ginger root pieces 6 inches apart, and cover them with an inch of soil. Firm the soil down gently with your hands to finish planting the ginger roots. Water the ginger immediately after you finish planting the rhizomes. Water the soil just enough to saturate it. Keep the soil from drying out by watering the plants regularly as they grow. Do not provide so much water that puddles form. Add 2 inches of shredded mulch around the ginger plants to keep the soil moist and help prevent weeds from encroaching on the plants. White butterfly ginger (Hedychium coronarium) does have edible tubers. The white flowers and buds may also be eaten. This is a relative of the ginger sold in stores (Zingiber officinale).